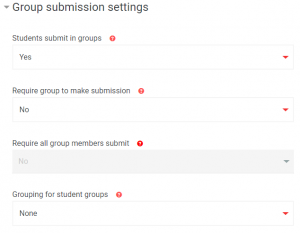 In order to use group submission, it is best to set the groups and groupings up (based on presentation groups) before creating the assignment but, if you do it after, make the assignment invisible to students until groups are finalised. If you are unsure how to create groups and groupings, please see Create and use Groups and Create and use Groupings. The process for setting up an assignment for group submissions is very similar to that for individual submissions. See Create an Assignment for individual student submissions. 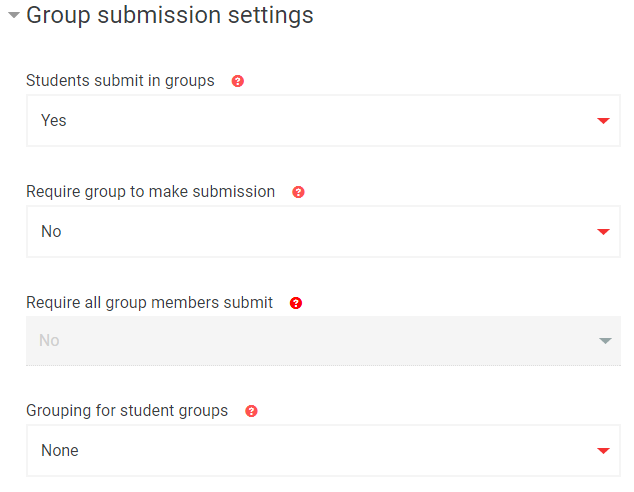 Select Yes on Students submit in groups. 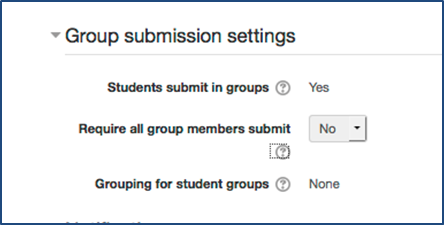 Select the relevant grouping from Grouping for student groups. N.B. This option will only be available once a grouping has been created. If you only want one person to submit on behalf of the group, leave this as No. This does not prevent multiple student submissions being made, but only the final one will be accepted. If you want all students to submit, set it to Yes. However, you also need to select Require students click submit button in Submission settings. It means that the submission will not be accepted unless all students click Submit. This setting should be used with care. Contact lti.support@lse.ac.uk if you are unsure.